There are lots of ways to cut costs at the supermarket checkout without going hungry or sacrificing quality. 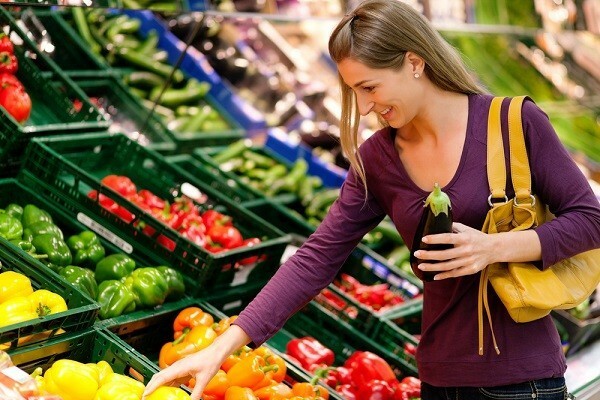 Here are some ways you can save money on your groceries. Saving money on food begins before you even before you set foot inside the shop or click on the supermarket’s online order form. Keep a writing pad and pen in the kitchen, or keep your phone handy to type up a shopping list. During the week, add to this list whenever you think of things you need. Remember to take it with you when you go shopping so you don’t forget anything. Only buy what’s on the list – this will make it easier to stick to your budget. Plan your meals in advance and add the ingredients to your shopping list. Create a menu based around items you already have in the pantry so you are using the food you’ve already got and buy fewer items. To work out how much you are really spending on groceries, use our free TrackMySPEND app for a few weeks to get a real picture of your food spend. Then you’ll be able to try to reduce that and create a reasonable budget you can stick to. Ask a friend to mind your children and go shopping without them if you can. You’ll have more time to compare prices and won’t fall victim to ‘pester power’. However, taking your kids to the supermarket from time to time can be a good way to teach them about money. Eat a meal or snack before you go to the supermarket. When you are not hungry, you tend to buy less food. Set a budget for your shopping trip, withdraw the cash from an ATM and only take this money with you when you go shopping. Don’t take any other cash or cards with you so you can only spend what you have. This old school way of budgeting worked well for previous generations before they had access to credit cards. Armed with your budget and your shopping list, now it’s time to stretch your grocery dollars as far as you can. Here are some ideas to save money at the checkout. Buy in bulk when things are cheaper. Cut larger portions of meat into smaller packages so you only use what you need and keep the others frozen to use later on. Cook a large batch of meals early in the week and freeze them to use as quick and easy leftovers. This can help avoid the last minute temptation of takeaways later in the week. Add your leftovers to your meal plan so you don’t forget they are there. If they go off before you eat them then buying and cooking in bulk becomes much less cost effective. If you usually go shopping each week, try shopping once a fortnight. This will help get you into the habit of using all the food in your pantry before you buy more. Swap brand names for generic products where you can. You probably won’t taste the difference, but the cost savings can really add up. Before you reach for the brand you always buy, check if you can replace it with a cheaper alternative. Check the ‘use by’ and ‘best before’ dates on food so you don’t waste money buying things you won’t use before you have to throw them out. Meat can be expensive, so buy less of it and try making more meals without using it. Lentils and chick peas are healthy alternatives that bulk up meals when you want to cook a vegetarian meal. There’s nothing wrong with an occasional treat, but putting chocolates, biscuits, chips and soft drinks into your shopping trolley each week will have an impact on your wallet as well as your waistline. Supermarkets carefully plan where they place products around the store. The items they promote are usually at eye-level, so take the time to check the shelves above and below for any cheaper alternatives. This takes a little more work but it can make a big difference to your shopping bill. Some grocery stores have special aisles with impulse buys that you would never think of buying unless you thought they were cheap and on sale. If you can’t trust yourself to walk out of the store without purchasing a few of these, avoid the aisle completely so you are not tempted to buy unnecessary items. Remember, just because they are cheap doesn’t mean you need them. Money Saving Tips – Avoiding the January blues Article: How much is your time worth?